CSCM IT Solutions: Sharepoint WSS 3.0 - Microsoft##SSEE is not accessible to missing Windows Internal Database signatures. Sharepoint WSS 3.0 - Microsoft##SSEE is not accessible to missing Windows Internal Database signatures. So here is the problem with my companyweb site, a HTTP 404 page not found error. A quick check of the event logs finds this message. Event ID 6800 The database ShareWebDB on SBIZ\Microsoft##SSEE is not accessible to missing Windows Internal Database signatures. 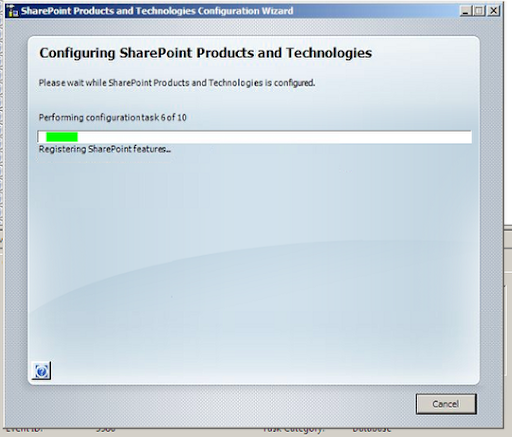 What this really means is that a Windows Security Update for Sharepoint has been applied but it cannot complete untl the Sharepoint Configuration Wizard is ran, so this leaves you in limbo. This is why we use monitoring to tell when our websites are offline. We use GFI Remote Management, they are a UK business and we think their software is awesome so go find out. The first step is to stop the provisioning service. stsadm -o provisionservice -action stop -servicetype spwebservice -servicename ""
The second step is to start the provisioning service. stsadm -o provisionservice -action start -servicetype spwebservice -servicename ""
Is it one of those days? As ever, things do not always go to plan. So when I tried to upgrade the Sharepoint Site, I was presented with this error. What this means is that the upgrade failed and we should consult the logs to find out why. Well it turns out what you need to do is restart the Windows Internal Database Services first. I ran the GUI version of the Sharepoint Configuration Wizard so I could see each step and this time the upgrade completed. Once the upgrade is completed, you can confirm this in the Windows Event Log, the event ID is 101. 1. Stop the Windows SharePoint Services Timer service. 3. Move all the xml files to another location. 4. Also backup the cache.ini file. Then Edit the cache.ini and replace the current value with "1". 5. Restart the Windows SharePoint Services Timer service. New xml files will start appearing in the guid folder. 6. Verify the cache.ini now contains its previous value (or verify that the value is no longer "1"; any non-1 value is fine). Rerstart the Windows Internal Database Service and then ran the wizard again. And it worked! Thanks for the additional Jimmy, one size nevers fits all does it? So its good to get another approach! The command line upgrade worked perfect for me thank you for the help!! !